It was Book Week at our school a few weeks ago…and what’s a Book Week without a ‘dress as your favourite character’ competition? As you can probably tell, I don’t muck around when it comes to dress-ups; especially when it’s for a school function. I get a thrill out of making myself look as ridiculous and/or hideous as possible. I think it’s important for students to see the vulnerable side of their teachers every so often to remind them that we are in fact human. If you’re lucky enough to be seen as a role model by a child/children, I think it’s so important that you allow them to see how you interact and respond to any given situation; not just those where you feel confident and in control because let’s face it…that’s not reality! The influential adults within children’s lives, whether it be teachers, parents, coaches or friendly neighbours, need to start getting more real with kids. By exhibiting our flaws, our emotions and our ‘ugly side’, kids will know that it’s OK and normal to do the same. Attempting to uphold squeaky clean, robot-like perfection is tricking kids into thinking they must have it all; the looks, the answers and a permanent smile to hide behind. I realise this post has turned into a rant of sorts but if it means that one more teacher or adult is willing to make a fool of themselves for the sake of a child’s self-esteem, then I’m satisfied. 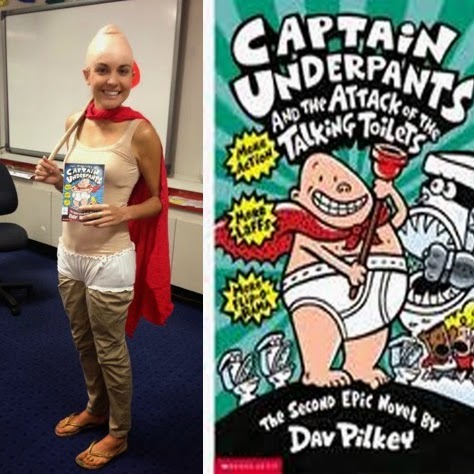 Feel free to steal my bald headed, diaper wearing, adult-baby (Captain Underpants) costume idea next time you’ve got a dress up party…you’re welcome.